A quick snapshot of the retirement crisis we’re approaching. As thousands of baby boomers reach retirement age each day, there never has been a more important time to review your financial plans and make sure you’re prepared. What Is The Retirement Crisis? Many Americans are unprepared financially for retirement, to such an extent that the situation could be termed a retirement crisis. It is estimated that half of households will fall short of money in retirement. This can be particularly problematic as we are living longer and expect to spend more of our time in retirement. Those retiring in today’s environment face some unique challenges. They can be expected to have longer lifespans, which is a double-edged sword. The increased longevity comes at an increased cost. As retirees spend more time in retirement, the effects of inflation may be even more pronounced. Social Security is not intended to provide all retirement income, yet the pension plans more common for previous generations have largely been replaced with defined contribution or 401k style plans. This can be just as good or even an advantage for some retirement savers, although some of the decisions an account holder must make on their own can be a challenge for some to navigate. Taxes and healthcare present special challenges for retirees since those expenses may potentially increase disproportionately to others. No one knows what tax rates or healthcare costs will be in the future, although there are reasons to speculate that taxes and healthcare may represent an increasing portion of expenses for many retirees. We are currently in a relatively low tax environment with a relatively high national debt. These facts point to potential tax increases in the future. The direction of healthcare costs in the future is anyone’s guess, with legislative changes expected in the near future. Add to all these issues the fact that in retirement every day is Saturday, which can potentially lead to increased spending. When do you spend more money now? Monday when you’re at work or on the weekend? What exactly does it mean that half of households fall short of money when they retire? The specific situation may surprise you. We may all fall short of money if our expectations are high enough. The specific situation may be quite surprising. Consider that about 31% of Americans have no retirement savings and no defined benefit plan.1 This means that their only source of income in retirement may be Social Security, a program that is intended to provide some but not all retirement income. These retirees may also potentially have earned less during their working lives and thus receive less in Social Security benefits. There is one silver lining to this statistic in that seniors own their home (many owning outright) at higher rates than the population at large, although accessing their equity via reverse mortgage or downsizing may not be the preferred outcome for some. There are wide ranges of financial experiences among those in retirement. For example, the Center for American Progress found that the top 20% of working-age households by income held 67.7% of all retirement assets while the bottom 50% held just 7.4% of assets.1 This wide difference can have substantial implications for those who find themselves in the latter category as well as the overall economy. For those still working who hope to build savings that support their desired lifestyle in retirement, these facts can be concerning. Addressing retirement savings as early as possible and developing a plan can help ensure that the retirement crisis does not directly affect you. This can include contributing to company retirement plans as well as your Individual Retirement Account (“IRA”) to the extent possible during your working life. Consider working with a qualified professional to help guide you along the way. With appropriate planning, you can increase your chances of reaching your retirement saving goals. 1 – Miller, Keith. 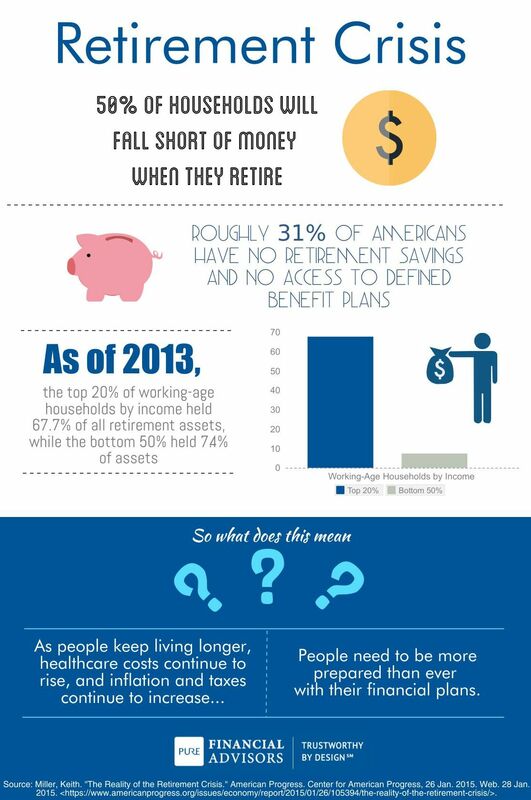 “The Reality of the Retirement Crisis.” American Progress. Center for American Progress. 26 Jan. 2015. Web. 28 Jan. 2015. <https://www.americanprogress.org/issues/economy/report/2015/01/26/105394/the-reality-of-the-retirement-crisis/>. Join us for a one-hour lunch n’ learn as we discuss the current state of the economy, the new tax reform, how to reduce taxes in retirement, and appropriate investment strategies for volatile markets. Don’t leave Financial circumstances to uncertainty, solidify your financial plans with the help of experts.